Today we'll revisit the containers installed early in the season. This show is dedicated to summer maintenance, Dr. Rick shows us how to care for our plants, from pruning to watering. Our guest gardener feels her plants have done well, almost too well, they've gotten large. They're at the point where they're too big she feels they're out of control and isn't sure what should be done. Dr. Rick thinks everything looks stunning, everything is blooming, there is a lot of growth. We first look at the Butterfly Bush, Buddleia. It has grown to the point that it is choking out other plants, the Lantana, for example. There are several options for this plant. One is to tree form it. Meaning, it could be pruned leaving one main strong trunk at the base. To do this, prune out all the smaller side and lower branches, leaving the main branch. This allows the top to create a canopy and is called "tree-forming," and creates an interesting effect. It allows sunlight to get into the plant causing it to thrive. The other option, and this is Dr. Rick's favorite, requires some thinning. Find two or three branches and follow them all the way to the base. With a good set of pruners remove those branches. This will open up the plant, allowing sunshine all the way down to the base, allowing growth at the base. Pruning is localized. Where the cut is made is where growth will occur. This will allow the remaining Buddleia branches to thrive yet not destroy its' interesting form, it will not look like it has been pruned. When pruning cut as low as possible, don't leave much of a stump. Rick follows one branch back to the point it touches another branch, known as a latent branch. The latent branch isn't growing because all the energy of the plant is going up the larger branch. When pruned all the food moving up the larger stem will stop and allow the smaller two branches to thrive. Once complete the other consideration is dead heading. This is a plant that is not self cleaning. A self cleaning annual or perennial is one whose flowers or blooms fall off, then flower again. Buddleia doesn't do that. To dead head follow the spent flower head back to the base and clip it off. It is time consuming and takes patience because it shouldn't be cut just anywhere. But once done the energy will go to new buds allowing those buds to bloom. Dr. Rick notices this plant has a small infestation of Spider Mites. They are not insects but are more related to ticks, very small critters - probably 20 would fit on the head of a pin - and are rasping. They cut through the outer layer of the leaf and lap up the juice. This creates a mottling effect. Since they hate water, to disrupt their lifestyle syringe your plants. This means put your thumb over the end of the hose and wet the plant down once or twice a day. It bothers them but doesn't kill them but they won't reproduce normally, slowing their advance. Our guest gardener next shows Rick her cottage container. This has beautiful Daises but she isn't sure where to cut the deadheads. Once these flowers are spent they detract from the look and they don't grow as much. If just snipped off, the plant doesn't look very nice. To address this problem trace the stem back to where a leaf is emerging. We see a little leaf towards the base of the plant. That is a latent stem and it will emerge as soon as it gets more energy. Prune the larger, older stem a little above the latent stem, getting as close as possible without damaging it. If too much of the dead stem is left it becomes a perfect source for fungus and bacteria, plus it won't look very good. By pruning now the plant should produce a flower before the season ends. 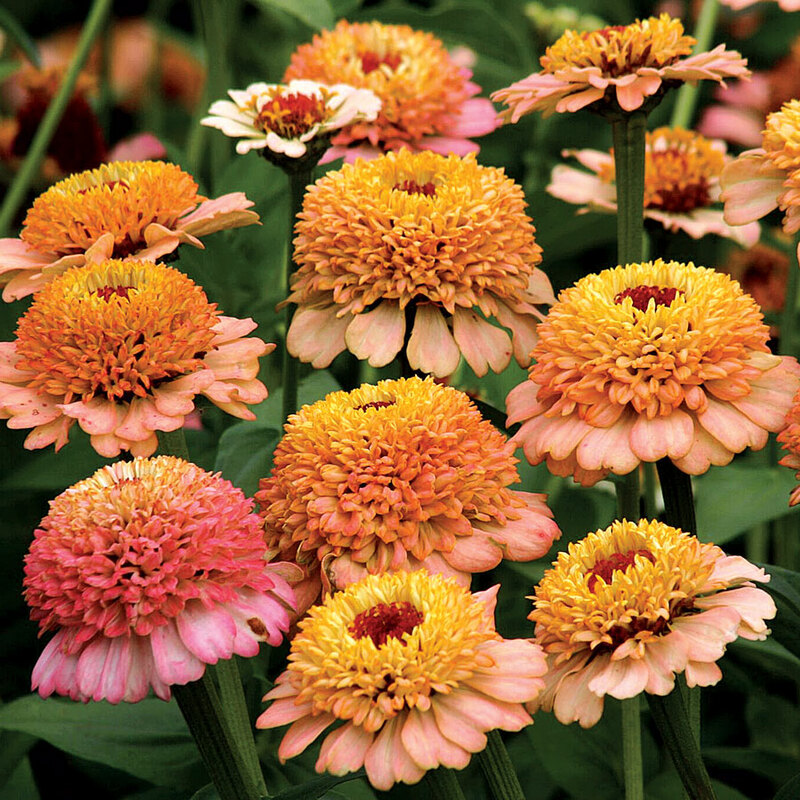 If you like Daises as cut flowers Rick has several tips. Cut them early in the day, when the sun comes up, at that point they're full of moisture and will last longer. Also cut them when they're just starting to open. If cut later they won't last as long. Another good idea is to put them in water and add a little lemon lime soda. The soda will provide sugar and citric acid which will keep bacteria down. Then keep them cool and out of the sun if possible. They should offer enjoyment for a longer period of time by following these simple tips. The Coreopsis Verticilata, Thread leaf Coreopsis, has performed well in this container. In fact it has been the easiest thing planted all season. It is a great plant, a nice accent and provides a nice contrast in terms of leaf size to the Lantana. Its' yellow flower is the same color as the center of the Shasta Daises, thus blends very well. It is starting to wane, therefore each head could be pruned down to the next set of leaves but that would be terribly time consuming. The easier solution is to select an area where there aren't a lot of flowers and shear that area. Cut back about one third up to one half, giving it a hair cut. This removes a significant part but opens up the plant. Do this intermittently throughout the plant. It opens it up, allowing air in, rejuvenates the plant encouraging it to grow. This year viewers from all across the country have sent us unusual ideas for our "garden tips" contest. Kim Gallagher from Columbia, South Carolina sent us this one for containers. Oftentimes containers and vacation don't go together. While we're gone containers tend to dry out. Kim takes a large soda container and with a tack or pin puts a hole in the cap. Don't make the hole too large or the water will drain too quickly. Place the container in the soil of the container, cap down, this allows the water to slowly drain into the container, providing an extra few days of water and peace of mind. In our gardeners favorite container she choose plants that wouldn't be overpowering. So far they have done well, they haven't grown dramatically and she wants to keep them as they are. We first look at the False Heather, it has been a great plant. Under careful examination we notice the plant is dying back at the base which is normal in high humidity areas. This is referred to as "melting." Fungus and bacteria are attacking the plant. We want to get good air circulation in to the plant. To do this remove several branches intermittently throughout the whole plant. It shouldn't look like it was scalped. it should keep it good looking, but remove some of the dead area. This is thinning all the way back in, just like with the other plants. Look for the small leaves at the base of the plant and prune to that area. By getting sunlight on the leaves, they will come out, the plant will continue to bloom, it will get full and stalky and get rid of the melting. The Tiny Tower Cypress was an excellent choice for this size container, very proportional, about one and one half times as tall as the container. It fits well in the area and adds a nice vertical accent in the back. When pruning Juniper type plants if pruned all the way back to the base, where there is some older growth, it will not come back. It is important to lightly prune only the tips. This will keep the plant tight and handsome. If a hole or brown spot were to exist it is easy to try to prune these plants intensely but it isn't a good idea. Another container, her scented container, has Jasmine and is climbing up the house. Our gardener is concerned, she doesn't want the house damaged. If the house were brick or wood it could cause a problem, since it is vinyl, plastic, it will pose no problem. The moisture that will accumulate under the plant won't hurt the vinyl. If the surface had been painted it might cause some rot over time. Instead it adds interest to this wall and shouldn't be cause for concern. Our gardener has another concern. This plant bloomed prolifically when first planted, but hasn't recently. It is healthy because it has a lot of new growth. What is the problem? Oftentimes if too much nitrogen is added to plants it will produce a lot of green growth. That doesn't appear to be the case with this plant because the Heliotrope and some of the other plants are still flowering. This container contains Jasmine and Gardenia, both bloomed in the spring but not much after that. Understand that is natural for a lot of plants. If these were an annual like the Heliotrope, it would bloom from the time it was put in the ground until frost, That's the nature of the plant. But Gardenias and Jasmine are perennials, they will produce one good full source of blooms, typically in the spring or whenever they naturally bloom, but typically they don't have a profusion of blooms after that. A few more blooms might be coaxed by cutting it back somewhat but they probably won't flower a lot more. One time a year is about all that can be expected. As a result the foliage is important. The Lavender has light green, almost gray-green, foliage. Next to it is the Gardenia with its' glossy green foliage, then next to that the coarse texture of the Heliotrope. The contrast is stunning. In the tropical container, the Cannas have done exceptionally well. They have bloomed all summer long but again the gardener isn't sure how to prune this plant. One gardening book said to cut the stalk all the way down to the ground, not just dead head as she's been doing. Dr. Rick says that if this plant were in the ground and the root system were extensive and into native soil it might be good to clip it down to the base. Since it is in a container and the root system is restricted it doesn't have the opportunity to rejuvenate itself as much, Rick would just enjoy it as it blooms, take advantage of the foliage, particularly since the foliage is as good looking as the flower. Accordingly, just cut the bloom when dead and enjoy the plant. Watering is important to plants this time of year. This gardener waters every other day this time of year. Dr. Rick says that this time of year the person at the end of the hose determines the success of the garden. Water intermittently but water thoroughly. Completely saturate the container so moisture is draining out the bottom. Then, let it dry out, give it a day, even two depending on the weather and the plants. That causes the moisture to move down through the soil, encouraging the roots to grow throughout the entire container. Containers get really hot in the sun during summer. It's not unusual for the temperature inside the container to be over 100 degrees, thus the plants need more water during the summer than earlier in the season when it's cooler. Everybody reads in gardening books that it is important to water early in the day. The key though is if the plants are thirsty at 3 o'clock or 5 o'clock get them water because the soil is drying out. The soil will actually move away from the side of the container and can destroy their root system. If plants aren't performing as you want don't be afraid to water them 24 hours a day. Optimally water early in the day so the plant has the opportunity to dry and the water evaporate but in really hot areas they're not going to have a fungus and disease problem so timing isn't that important. A great tool for watering is a wand. As the water moves through the hose the wand breaks it up, simulating rain. Hold the wand upright, allowing the water to come up, then down over the plants. Another good idea is to take a plant feeder, remove the top, then attach the wand to the feeder. It acts as an extension, allowing it to get into the interior of gardens and containers and place water next to the soil surface, thereby not blasting the soil away. Plus this method delivers a good solid supply of fertilizer as one waters. This gardener loves Butterflies and Hummingbirds. She has finally found one that works and has found a contraption that keeps ants away from the Hummingbird feeder. The ant trap is a little cap at the top of the feeder and is filled with water, making it impossible for ants to cross the moat and get down to the Hummingbird food. Dr. Rick cautions that it is important not to make the Hummingbird food (sugar and water) too concentrated. If too much sugar is added it can dry the birds out. The "pond in a pot" has been a hit. Everyone has asked about it. The plants have succeeded and the fountain sounds wonderful. It is low maintenance, just make sure to keep water in the fountain and check the filter to make sure it is clean. To get more details about constructing the "pond in a pot" go to our web site, click on past shows, click on show 10 and the directions for making one are there. Dr. Rick thanks our guest gardener. Her questions represent many asked via our toll free phone number and email. We trust we've not only answered her questions but those of many in our audience.